Islamic. Abbasid Caliphate. Al-Mahdi. AD 775 to 785. Silver Dirhem. 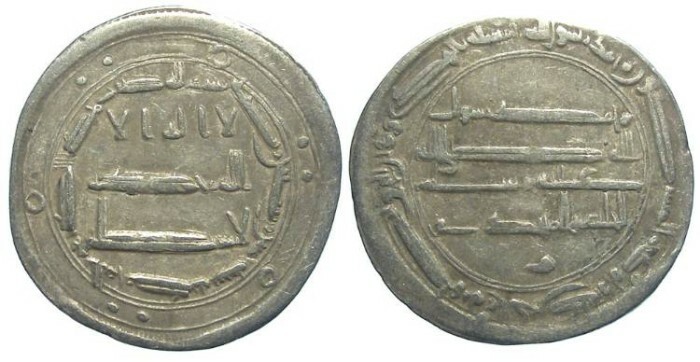 Abbasid coins of this period do not name the Caliphs, and are assigned to the rules based on the dates on them. Date : AH 165 (AD 781). Reference : Album 215.1. Mitchiner Islamic 159 variety. Size : 23.8 x 25.1 mm. Weight : 2.94 grams. Obverse and Reverse : Arabic inscriptions. On the reverse there are three groups of two pellets around the edges.